Today I’m 50! Happy birthday to me. 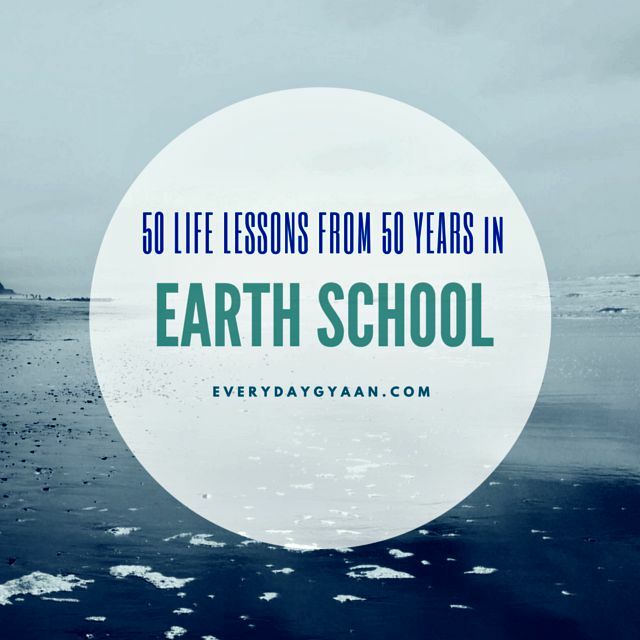 What better way to celebrate it than to recall all I’ve learned a half century of living on this our beautiful Earth. You might find some of them seemingly contradictory, but they’re really not! You are on this Earth school so that your soul can prepare for the next phase of living. Be open to all learning. At the end of your life you want to be proud of the choices you’ve made. Make good choices. If you have made poor choices, own them and imbibe the lessons they were meant to teach you. Life is no picnic, but neither is it a drudge. Learn to enjoy every aspect of it. You get to write your own life story. Make it a bestseller! You are responsible for your life. Don’t let it be hijacked by anyone else. Put yourself first. Invest time getting to know yourself. Remember, you have to live with yourself for the rest of your life. Sing in the shower. Happiness is an inside job. Choose to be happy. Don’t take yourself too seriously. I promise you that the world won’t come to an end if you wear your clothes inside out in public! There’s nothing better than a good belly laugh. Laugh often. Plan for the future, but live in the moment. Don’t let your past dictate your present choices. There are mean people in this world. Learn to deal with them skillfully. There are good people in the world. Make sure you connect with more of them. Give of your time and presence to others. Value your time and let people know that you do. Be punctual. Don’t waste other people’s time because you can’t be better organized. Take nothing for granted – not even the air you breathe. Be grateful for everything. Gratitude will see you through a lot of difficult times. Take care of yourself. The world owes you nothing. The Universe is very benevolent. Learn to plug into its resources. Practice mindfulness. Self-awareness is the key to living a mindful life. Be kind. Your acts of kindness especially when done with no expectation of reward, will bring much soul satisfaction. Be open to love. There’s always that one person out there that will get you. Keeping looking for him/her. Be God-aware. Know that there’s a Higher Power in control of the Universe. Seek intelligent company. Learn to make intelligent and interesting conversation. There’s nothing worse than a bore! Realize that everyone is creative. Find your creative outlet/s. Practise forgiveness. Forgive yourself and others too. Give and you’ll get. (Yes, Mom, I know you told me that!). Have dreams and goals. Know when to pursue them and when to let go. Sometimes the best learning is from unfulfilled dreams and unaccomplished goals. Know when it is time to let go of a relationship. Believe me, you and the other person will survive (thrive, even!). Money is not the root of evil. Envy often is. Get yourself a pet. I’d suggest a dog, naturally. Appearances can be deceptive. Learn to look beyond the obvious. Don’t trust anyone who is nice all the time. Learn to value your own opinion. Take the advice of others, but the final call should be yours. Shrouds have no pockets. You can’t take your wealth with you. Be prudent, but never miserly. Get a regular massage. You deserve to feel good. Drink plenty of water too. Live in grace, never in guilt. Be comfortable with your emotions – they are only indicators of what’s going on within you. Count up to 10 before you write an angry letter, email or social media update. Run it by a trustworthy person before you send/publish it. Take regular naps. Rest your body – it’s good for your soul. Make room for awe – a sunset, a baby’s birth, a baby’s smile – let them fill you with awe. Remember that you haven’t seen it all, experienced it all and don’t know it all. Be open to new experiences. Life is short. Make it meaningful. Reach for your dreams, but remember that every day on this earth can be a dream too. Make it a technicolor one. And there’s a bonus of 25 quotes which are life lessons in themselves! Enjoy! I’m over 50, and I sing in my car, and love a regular pedicure (didn’t have my first until after 50!) Absolutely fabulous list and what a great list of bonus quotes at the end! Thanks! Sharing! Happy 50th year of learning to you. What a way to look at years that are given us! I felt so connected with 14&15. They’re like two sides of the same coin and kind of summarises our experiences with people. Happy 50th birthday Corinne :). Each of those life lessons are so important. Truly inspirational :D.
Great post and very useful advice for any age. Happy Belated Birthday! Happy birthday! I like the saying that shrouds do not have pockets. I’m not sure what I could add to this comprehensive list. Thank you for sharing! There is not enough ‘silliness’ in the world!! Loved it! Very much agree with #20 (just trying to fit in) but disagree slightly with #34. And just when I was heaving a sigh of relief at the end of the bonus lessons, I get sucked into your draft for the 100th!! Nice! Much love your way. Happy birthday. It is a pity we get wiser as we get older and not the other way round. Enjoy the next decade. Beautiful Corinne ! pray that every dream of yours come true ! thanks for sharing ! Lovely post. It’s a shame we don’t teach these lessons in school. Happy birthday. Happy birthday! !!! And yes a good belly laugh is remedy for the soul! ! Happy Birthday! I remember my aunt telling me when I entered that decade that it would be one of the best of my life. She was right! Lots of wisdom in the things you shared. Thank you. Just saw this post on Prudhvi’s timeline so I thought I’d pop over and wish you a very happy 50th! may god give you the strength to sail through the next 50! God Bless! Wonderful insight, hope and inspriration! Happy Birthday! Welcome to 50!! Be the Rock who keeps on Rolling! Happy birthday, Corinne! May you be blessed with health and happiness! Thanks a lot, Vidya! Part of the club now!